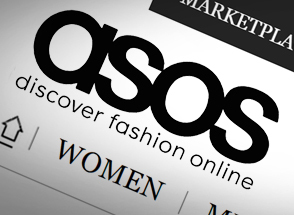 Excluding exchange rate effects, ASOS delivered sales growth of 12% in the first half of the year, to £1.3bn. Competitive pressures in Europe and the cost of warehouse disruption in America, meant profit before tax fell 87% to £4m. However, the group remains on course to meet lowered full-year targets, announced in December 2018. The shares rose 4.8% following the announcement. Debenhams' fall from grace shows how tough retail's been. A lot of the sector's struggles have been put down to online competition - and ASOS' difficulty keeping up with demand in some regions is testament to that. But that doesn't mean the online player is totally immune from the problems plaguing its bricks and mortar rivals. A surprisingly weak statement in December saw ASOS significantly wind back sales and profit forecasts. Perhaps of greatest concern is pricing pressure, particularly in France and Germany. Traditional high street stores are upping their game online, and new challengers like Boohoo are moving fast to grab market share. Competitively cutting prices will keep the virtual tills chiming, but is a bit of a nightmare for profitability. On the plus side, ASOS has proven adept at using social media to build and maintain relationships with customers, and there's no reason the formula won't remain successful. After all, it only has a small share of the vast clothing markets of the UK, Europe and the US and is still growing rapidly. However, there's no getting away from the fact the extra competition means investment is required. Margin guidance has been cut to just 2%, and the extra marketing and distribution costs mean they're only likely to inch up from here. Overall, we still think online fashion represents a significant opportunity, and ASOS has the balance sheet and marketing nous to capitalise on that. But the last few months have been a major shock to the system and woke investors up to the fact it's an ever-more competitive space. The number of active ASOS customers increased 16% in the period, which partially offset a 2% decline in average basket values. In the UK, sales grew 16% £481.5m, driven by increased order frequency and improved conversion. US sales fell short of expectations, with growth of 4% at constant currency. That reflects challenges at the Atlanta warehouse, where demand far exceeded capacity. Shipments that were delayed to clear the backlog are expected to be recognised next quarter. Sales in the European Union rose 10% to £402.2m at constant exchange rates. Challenging conditions in France and Germany, the group's two largest European markets, held back performance, as the group continued to cut prices. Following a tough Christmas, the Rest of World division delivered overall sales growth of 9%, reaching £236m. Operating expenses increased 17.7%, with the biggest increase coming from higher warehouse costs. With capital expenditure outpacing profits in the year, ASOS fell from a net debt position to £37.9m of net debt. Retail gross margins fell to 47.4% from 48%. ASOS remains confident of meeting its full year guidance of 15% sales growth, an operating profit margin of 2% and capital expenditure of around £200m. It said it will return to a net cash position by the end of 2020.